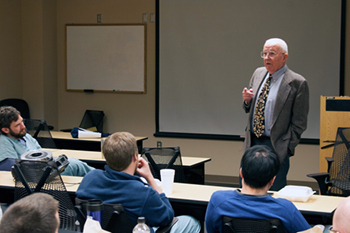 William Bass, PhD, forensic anthropologist well known for his research at the University of Tennessee facility commonly known as "The Body Farm," recently presented to Radiology residents, discussing the investigation of a past case to illustrate the importance of radiology as a tool utilized by forensic anthropologists. Tingting Xu, PhD, Center for Environmental Biotechnology, "Autobioluminescent Cells: A New Tool for in vivo and in vitro Bioimaging"
Vermont Dia, PhD, Department of Food Science and Technology, "Luteolin and Epithelial-to-Mesenchymal Transition in Ovarian Cancer Chemoresistance"
Francisco Barrera, PhD, Department of Biochemistry, Cellular and Molecular Biology, "Novel Soluble Peptides with pH-Responsive Membrane Insertion"
Tim Sparer, PhD, Department of Microbiology, "The Role of Chemokines in Cancer"
Scott Stevens, MD, Professor of Surgery, Director of Endovascular Surgery, and Co-director of the Aortic Center, delivered the Presidential Address at the 40th annual meeting of the Southern Association of Vascular Surgery in Cancun, Mexico. The speech, which he wrote in consultation with Harvard School of Business Professor Clayton Christensen, was entitled "Pioneers and Innovators: Creative Disruption in Vascular Surgery." The Southern Association for Vascular Surgery is widely considered the most established and vibrant regional vascular organization in the world. Dr. Stevens's presidential address will be printed in the Journal of Vascular Surgery. 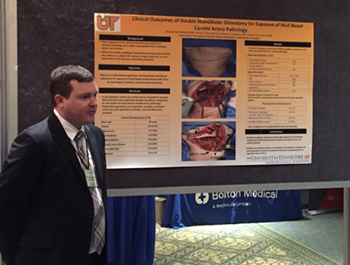 Surgery Resident Ryan Buckley, MD, also presented two posters. His presentation, "Clinical Outcomes of Double Mandibular Osteotomy for Exposure of Skull Based Carotid Artery Pathology," is co-authored by Joshua Arnold, MD; Michael McNally, MD; Oscar Grandas, MD; Scott Stevens, MD; Mitchell Goldman, MD; Eric Carlson, DMD, MD; and Michael Freeman, MD. He also presented "Dietary Zyflamend Inhibits Intimal Hyperplasia Development via the Attenuation of Macrophage Infiltration in a Rodent Model of Vascular Injury," which is co-authored by Deidra Mountain, PhD, Lindsay Bools, MD, Stacy Kirkpatrick, Jay Whelan, PhD, Paul Terry, PhD, Michael Freeman, MD, and Oscar Grandas, MD. 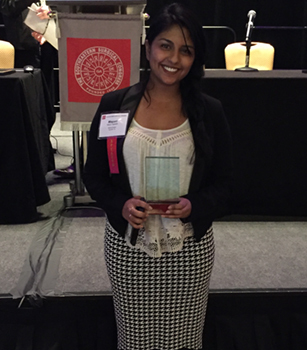 Miyuri Jagadish, UT Knoxville student, won a gold medal at the Southeastern Surgical Congress for her paper, "Diabetic Foot Ulcers: The Importance of SACredit Patient Comorbidity Recognition and Total Contact Casting in Successful Wound Care." The paper is co-authored by Mitchell Goldman, MD, Michael McNally, MD, Eric Heidel, PhD. The Gold Medal Forum Committee says a Gold Medal Award is a prestigious recognition of excellent research. An article on "Contemporary Update on the Treatment of Dog Bite Injuries" by Michael Foster, DMD, and J.W. Hudson, DDS, was named by the Journal of Oral and Maxillofacial Surgery Clinical Focus on Facial Trauma Update as a top 10 read in the February 2016 issue. Maricarmen Malagon-Rogers, MD, recently retired as associate professor and pediactric nephrologist following 26 years of service to UT. 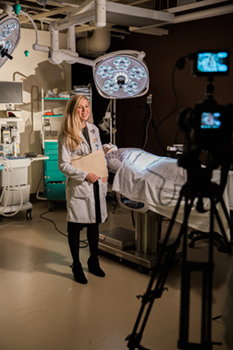 She taught in the Department of Family Medicine for 14 years, serving as a role model to residents, physician, and advocate for Family Medicine. 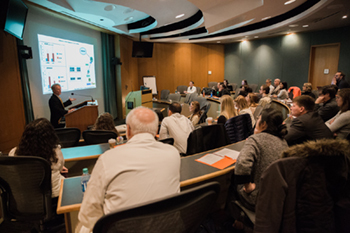 Scott Stevens, MD, Professor of Surgery, Director of Endovascular Surgery, and Co-director of the Aortic Center, presented, "New Infrarenal EVAR Devices in Clinical Trial." See his presentation on YouTube.